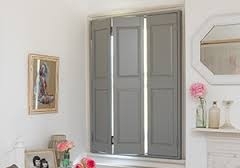 Solid shutters are very popular in Victorian houses due to their rich history in Victorian architecture. They also help where noise and security is an issue that needs to be tackled. Carolina Blinds also offer the option of using solid shutter blinds as room partitions, these shutters are bi-folded to allow complete opening or separation when required.